Puzzles not only test your Mathematical abilities but also Logical Reasoning. 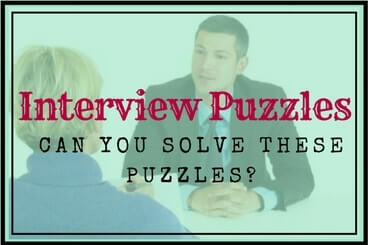 Now a days Interview candidates are being asked different types of puzzles to access candidates Logical Thinking. Many of the times these kind of puzzles appears in the written examination which is used to screen the candidates for the next round. Sometimes puzzles are being asked in the interviews. I myself has taken many interviews in which I will give candidates to solve logical printable puzzles. There are many innovative puzzle questions being asked in big corporate interviews such as Microsoft, Google, Facebook, Amazon etc. Here are links to some of the puzzles questions which are repeatedly used during the interviews and written tests. Do click on the corresponding pages to read these interview puzzles.